Interesting project Frank. I've been enjoying seeing this progress. You've got some good continent shapes and islands there, and the mountain ranges look like spines from continental tectonics. That overal texture is very good too. Would it be useful to have a pole to pole set of masks you could use to blend between lateral regions, ie textures blended between equator - northern europe - arctic - polar, etc? What is the polar axis you're using, along x,y,z? I am currently only using the Y component to generate the lush equator and the dry belts (thanks for the hint, ChrisC ). Further down the road I also plan using some longitude based masks. Global texturing isn't easy, but moreso is global displacement! Only the slightest changes in one fractal already create weird unwanted effects elsewhere on the planet. There is a frall dependency between some nodes that surprised me a bit. Should I ever make this available, then I will group all those nodes together that have to do with the landmass and name that group "HANDS OFF"
@freelancah: thanks! I had more and deeper water transpareny earlier that looked nice, but was too exaggerated to be real. I am not sure how much color variation there really is about the water, when looked at from space or orbit... I couldn't find a reference photo. Definitely use the Latitude/Longitude Blue Marble images as reference material. What is nice is you can get real close and color drop select certain climates to transfer over to your project to. Have you seen this frankB? Could be useful to someone. Would a latitude/longitude mask be any help or do you find it easy to enough to mask based on those already? I've been doing a bit of geographical stuff lately and it occurred to me a lat/long mask might be useful. 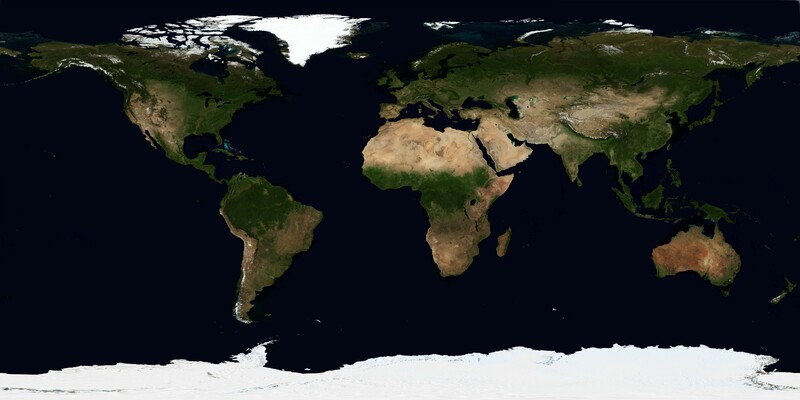 I should have posted a whole earth image in true color for reference from the latest blue marble imagery. I would just build it from the planet normals, Jo, but if there would be a single node providing customizable lat/long masks, that would be better. Excelsior! (as Stan Lee would say) In other words, great image, great work! I was thinking the same Jo. It would be quite simple to knock up a node string that splits the y axis into mask regions. It would also be quite easy to put some modulation in the y blends along x, so that there aren't hard straight lines between textures. I'd like to have a play with this this evening for you Frank if you don't mind, and I'll post what I come up with. Ok, I won't post it then!! Next version. It's a 4k render, so there is a lot of detail to look at. Compared to the previous render, this one has some progress on procedural texturing, some fractal tweaks, some adjustments to the water transparency, tweaked atmosphere, and some placeholder global clouds (which will be replaced later). On my wish list, there are still a few things to tick off, though. This is looking better and better all the time! If you don't mind me asking, is this part of something that might perhaps be for sale at the NWDA site in the future? Just some more healthy observations.